Identifying when to take profit is not always as easy as it sounds. One of the options is to set a technical target, take profit or stop loss. Both options seek to lock in and maximize profits, but both come with risks, which is normal in trading. The broker IQ Option offers for forex (CFD) trading a feature called „autoclose“, which is exactly what we want – to set a take profit and stop loss. The common feature of both is the intention to maximize profit which cannot be achieved without some risk. If you fail to set the target correctly the technical target may not be reached or be exceeded. What may also happen is that the autoclose feature triggers well before a move is done (to stop a promising trade prematurely) costing you some percentage points of unrealized profit. Take profit is a price level on a chart at which price is expected to stop or reverse, or a price level a move is projected to reach based on a past price movement. This means that if the price touches this set line you will realize profit. The only weakness of this option is that the time it takes for prices to reach the target and what happens after they are reached is uncertain. If you want to succeed you must be patient and wait until the price reaches the projected level and then decide whether to sell or to wait. If you decide to sell you lock in some profit. If you wait, you face a risk that all that you have already worked hard for will have been in vain. Autoclose: The Autoclose feature is one of the most practical tools of every successful trader. Its main benefit consists in setting a stop loss target. By setting the autoclose to sell out at a loss, 5 to 15% traders may protect their capital from a total disaster and survive another day. 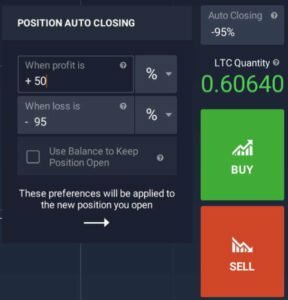 Without having this tool they would risk losing 100% of their trades. Therefore, be cautious how much you tolerate to lose! Many traders don’t even realize that the IQ Option autoclose enables two settings, one for stop loss and the other for taking a certain profit. Stop-loss and take-profit are available to traders not only trading with IQ Option but with other brokers or those who use the MT4 platform! Read more in How to trade Forex inMT4. Pros: When you set the take profit and stop loss targets you take all emotion out of the decision. When profits reach a satisfactory level, the trade is closed without any questions. This means that the trader does no longer have to sit and watch the trade speculating „Shall I do this or that“. Another pro is that it only takes one touch of the hypothetical target for a trade to be done. This pro comes handy during periods of increased volatility when prices reach the target level for a brief period. Cons: As to the cons of autoclose, there is only one: financial loss (or minimal profit). As many times as I’ve seen my profit targets reached I’ve seen them exceeded. I see the reason in the difference between the potential profits and what can be reasonably expected. Setting the take-profit at a certain level may guarantee a portion of the profit but it could only be a small portion of the maximum profits. Because trading should not be mixed with emotions I believe that these features are useful. Using the Autoclose feature is very simple. All you must do is set it to the percent of your capital that you want to protect in the event of loss or lock-in in the event of gains. A good rule of thumb for setting the stop-loss level is 3% of the total account, which is – if your total account is USD 10,000 – USD 300. By setting a stop loss at this level you will prevent a higher loss than USD 300. I personally set my target at 3% of my account i.e. equal to 30% of the trade. With the total of USD 10.000 on my account, trading volume worth USD 1.000 is acceptable because in the case of failing my loss will not exceed USD 300. Along with a percentage value, you can also specify the amount or number of pips. Setting the take profit target is a bit more difficult but only because you want to lock in the most profits you can. I personally set my initial take profit target at 50%. This means that if the trade moves up quickly I will reach 50% and make USD 500 (assuming USD 10,000 on my account). If prices begin to move in the expected direction (without reaching my take-profit target) I then start to adjust based on market conditions. The first thing to do is to slowly raise the stop loss to lock in more of your capital as the trade moves in your favor. The next thing to do is to assess the technical targets for profit and the likelihood of being reached and, if necessary, to raise the take-profit limit accordingly.